olloclip, the company behind the self-named 3-in-1 photo lens attachment for the iPhone recently named an honoree at the CES Innovations Awards, has now readied a version for the iPhone 5 and it’s ready to preorder. The iPhone is utilized by many as the only means of photography, and with innovative peripherals like the olloclip at large, it’s not too difficult to see why. There are plenty of options out there for those of you looking to use your iPhone for some serious shot-taking. As well as the many hundreds – perhaps thousands – of apps over at the App Store, one can buy anything from tripods to adapters, and while there are plenty of lenses knocking about for the various generations of iPhone, olloclip is arguably the most popular and well-known of them all. If you’ve never heard of the olloclip, it’s a very simple contraption which clips onto your iPhone, right over the lens. In adding the external lens, you can get various different effects when taking snaps, and the three olloclip specializes in are fisheye, wide angle and macro. While the standard of camera within the iPhone 5 means that, even with something like olloclip attached, one won’t be able to yield the kind of results a fully-fledged DLSR could offer, it’s a happy median for those who want a little bit more than what the smartphone offers as standard, but don’t want the sheer bulk of a Nikon or a Canon. As well as a black and white version to match your specific iPhone 5 color (not that you have to stick with them, of course), there’s also a red edition, and for 70 bucks, its a good way to enhance your iPhone’s photo-taking options whilst still being able to keep that all-important space in your pocket. Often, these little add-ons show promise but fall short when it comes to build quality. However, olloclip’s components include aircraft grade aluminum and coated glass optics, so as well as great photos, you’re also getting a relatively robust product. 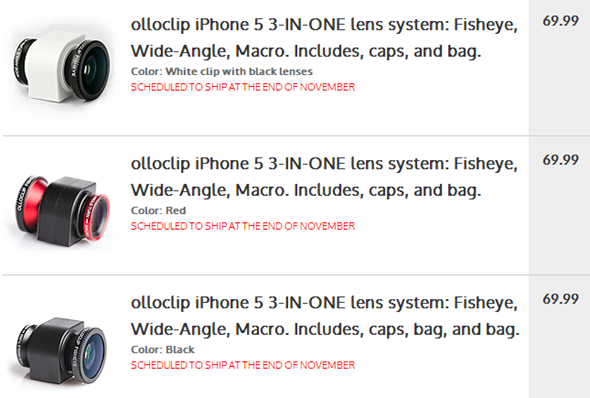 If you want to preorder the olloclip, you can do so from the company’s website. As stated, it costs $70, and will begin shipping at the end of November. Reviews of past versions have been generally positive, and with consumer interest in the iPhone 5 version very high indeed, you may want to pre-order sooner rather than later, as to avoid disappointment.